Region: This bug is found throughout North America. Life cycle: This insect produces several generations each year. The adults overwinter in garden rubbish. Physical Description: This shiny, black bug is dome shaped and measures only 1/10 to 1/5 of an inch long. The eggs are laid singly on the leaves of host plants. 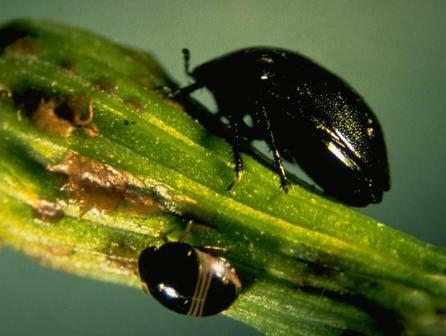 Feeding characteristics: This black Bug can be found on blackberry, blueberry, celery and raspberry plants. They feed in large groups on foliage and fruits. They can sometimes cause the fruit to have a bad flavor.